We spend lots of time on Wildlife Promise talking to you about amazing animals in the U.S. and elsewhere. But in my opinion, we don’t use nearly enough digital ink on marine life. I hope we can remedy that in part by putting out a monthly blog digest featuring a few odd or important news items about ocean creatures of all types. Enjoy, and please let me know what I missed. The rocky coastline of the Upper Spencer Gulf in South Australia is the only place in the world where the Australian Giant Cuttlefish spawn in large numbers, and it has become a popular spot for scientists and cephalopod-loving weirdoes like me each year. This summer, numbers are way down. Australia’s ABC Radio recently interviewed a local commercial fisherman who reported that he has only seen four this year—rather than the usual “hundreds of thousands.” Other news outlets have been picking it up too. Researchers say the low numbers are cause for concern, and they don’t yet know what’s causing the trend (though “BHP Billiton’s proposed desalination plant” nearby probably won’t help. It would reportedly pour “huge quantities of hypersaline wastewater” into Spencer Gulf and make the area unpalatable for a variety of species). A new study finds that the cuttlefish breeding colony had decreased by 78% in the past decade, and last year marked a record low. A program of the National Marine Fisheries Service plans to use cameras provided by the National Geographic Society to help clear the name of the imperiled Hawaiian monk seal. You can find out more about habitat threats to monk seals or read Les Welsh’s blog post from April about people intentionally killing the seals in the waters around Kaua’i (and how you can help). 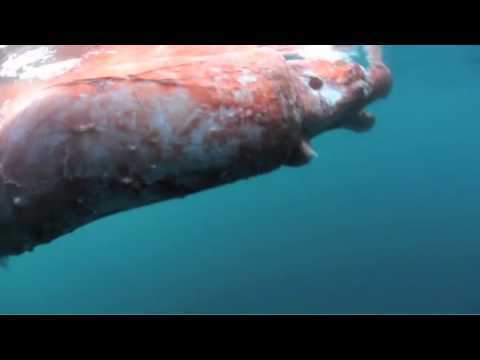 Giant squid are mysterious, awesome and locked in an eternal arms race with sperm whales. Live sightings are so rare that even footage of a recently dead Architeuthis is a pretty big deal. Recently, Australian angler and journalist Al McGlashan came across a largely-intact carcass whose bright red coloration indicated it had died recently. While he filmed, a blue shark tore into the squid, thus launching the best cephalopod viral phenomenon of 2012 (so far…I eagerly await your videos of octopuses singing ‘Call Me, Maybe’). Take a look at Field & Stream’s exclusive full-length video and photos right this second. Canadian lobster boat captain Bobby Stoddard caught a lobster in early May that resembled a giant Avatar cat person. That’s the way we say ‘it was blue’ in America now. You can learn more about invertebrates in our Wildlife Library. A study recently published in Biology Letters is the first to show how manta ray embryos get oxygen, based on video from an ultrasound performed on a pregnant ray in 2008. Though manta rays, like many other cartilaginous fish, give birth to live young, they lack an oxygen-giving umbilical cord or placenta. According to researchers, “the baby ray was raising and lowering its jaw, pumping uterine fluid in through its mouth and spiracle.” The continuous regulated flow of the fluid over the ray’s gills allowed the embryo to extract oxygen (the baby was “a healthy female, 2 meters from wingtip to wingtip and weighing 50 kilograms” at birth). According to Taketeru Tomita, a fish biologist at Hokkaido University Museum, this is the first time that scientists have observed fetal viviparious vertebrates pumping liquid to extract oxygen. Off the coast of fishing destination and cranberry-soaked vacation hamlet Cape Cod, two of seven great white sharks tagged last summer have been detected by their transmitter signals. Researchers say the sharks were drawn to the area by “a growing seal population on Monomoy Island,” redoubt of migrating birds and other non-humans for hundreds of years. They haven’t come close enough to tourist beaches to warrant any official warning, though mayhem will presumably occur if the star-crossed Brody family gets too close. For more on ocean creatures, see Kevin Coyle’s post from last year about animals’ various methods of swimming or my post about the Top 5 Real Sea Serpents (including the giant squid). You can also check out an article about sperm whales and the threat posed to them after the oil spill in the Gulf of Mexico. If you’ve seen a story that you think should be covered in the next Ocean Wildlife Roundup, please let me know in the comments below, email me at greenbergm@nwf.org, or tell me on Twitter @MaxTGreenberg.